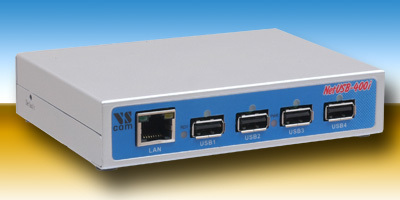 The NetUSB-400i is a USB Device Server for Ethernet operating TCP/IP. So you install the NetUSB in your LAN, and get four new USB 2.0 ports, which are accessed via Internet protocols. These ports are available for all computers on the network, so you can share the devices connected to the USB 2.0 ports. The ports are capable of USB 2.0 High Speed, which defines a maximum data rate of 480 Mbit/s. However due to network constraints there are minor limitations. Since the network is Fast Ethernet, the total data throughput has an upper limit at 100 Mbit/s. The NetUSB can buffer some amount of data, so devices with an average throughput well below the limit may operate just fine. The isochronous mode is also available. But again due to added network delay this may prohibit some devices with high demand from operating via NetUSB. That sounds like a serious problem, doesn't it? But in fact the phrase 'minor' is absolutely correct. The vast majority of USB devices simply operates via the bulk mode, which uses safe data transmission. There are no very special demands on data throughput or latency, at worst the operation is slightly slower. Here are some examples of such devices. The most obvious use of NetUSB is sharing low cost printers via the network. There is even a special configuration for such an installation in the NetUSB. The port with an attached printer is shared by several computers. When one PC is actually printing, the ports in the other PC are put on hold. Application software on these does not recognize that state, it simply sends the data to the printer port. As soon as the first PC finishes the print job, the port becomes available to other computers. The next one gets access, and simply sends the data to the printer. All this integrates seamlessly to the printing system, without noticed by the user. Of course it is also usable the other way, one computer controls up to four printers, remote from the user. Other types of devices are shared in turns. All computers may use the attached devices, like memory sticks, keyboard, scanner, external hard drives and so on. Even USB adapters for serial ports or Wireless LAN have been installed this way, though there are specialized devices better suited for the typical requirements of such operation. Imagine an office where several employees sometimes need to scan some pages. NetUSB connects to one or more flat bed scanners, they are located at a desk central in the room. All computers have access to the NetUSB and the connected scanners. So each user just reserves a scanner for her PC, then scans the papers for further use. Afterwards she releases the scanner to other people in the room. Instead of sharing the attached devices between computers, a single PC can control different devices connected to the NetUSB from a remote location. For example one PC controls several NetUSB, equipped with scanner/printer, keypad and faxmodem each. Such may build the station of a distributed fax system, where users authenticate via a bluetooth key. The bluetooth receiver is also connected to the NetUSB. Or they push-in a certain USB crypto stick into one port of the NetUSB-400i. The event of connecting the device starts a user defined application on the central computer, bringing the station to the operational state. What makes the NetUSB-400i special? There are several properties which make the NetUSB-400i a flexible device. The NetUSB is designed for an industrial environment. There is the wide-range power supply which accepts 9-30V DC. This power is connected to a Terminal Block. Suitable power sources are often available in industrial racks, where they may replace the wall plug adapter shipped with the NetUSB-400i. Further there is the metal case, for protection against mechanical stress. As defined by the specifications of USB, each connected device may consume up to 500 mA of current from its port. This is a total of 2 Ampere of current, quite a lot for the avarage small device. NetUSB-400i has a power supply capable of handling this situation. Usually the combined amount of current is less than that upper limit. The case has an option for wall mounting, or adding clips for DIN Rail fixture. The rubber feet make it also easy to place on or fix under a desk, prohibiting the cables from cluttering the desktop. The NetUSB-400i provides four USB ports in a small case, much smaller than an embedded PC.